It’s sparkle season! Time to bust out the sequins, glitter, and rhinestones. The holiday season is your time to shine, literally. I love to sparkle and shine just as much as the next glitter girl. However, I like to style my sequin pieces with a more casual edgy vibe as opposed to snow fairy dipped in glitter, If you know what I mean. Below I’m sharing 4 tips on how to style a sequin dress casually. Pick one sequin piece and keep everything else neutral. Let the main piece shine and don’t add anything else with sparkle. Black is my favorite neutral because it still lets the sequins pop without being too much. Depending on the color of the sequins you can also style it with nudes. 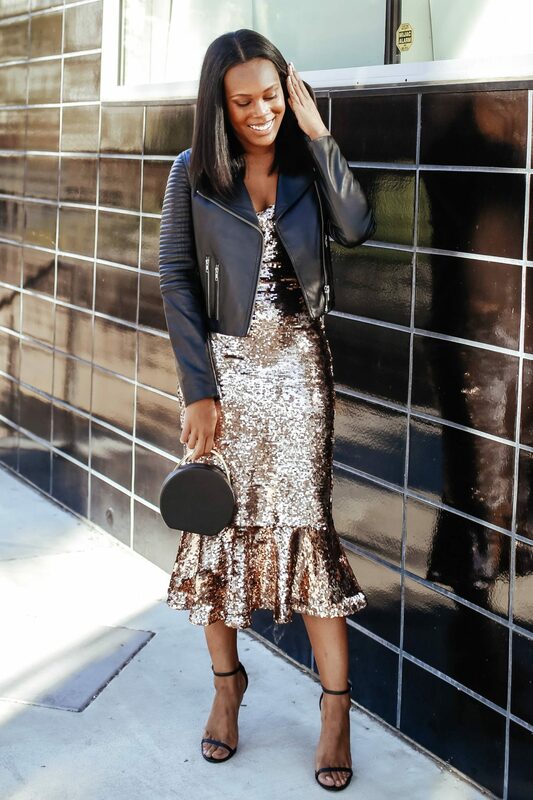 I loved the rose gold color of THIS sequin Dress and it looks so chic paired with my black accessories. The feminine look of a sequin piece pairs well with a rougher texture like leather. My favorite way to make any piece look edgier by throwing a leather moto jacket on top. I’ve also seen really cute looks with denim and sequins. Adding a rougher texture makes the sequin piece look more casual. It can be tempting to go over the top with accessories and footwear to pair with your sequin dress. More simple style accessories keep the look sleek! A great simple sandal and bag will let the main piece show and not make the look too overwhelming. Keep the jewelry at a minimum too. Hair and makeup change the vibe of any outfit. If you want your sequins to bee more causal, keep the hair and makeup casual too. I styled my hair simple and straight for a casual, relaxed look. For makeup don’t go over the top with shimmer and lashes. This tip really makes the look flow perfectly. 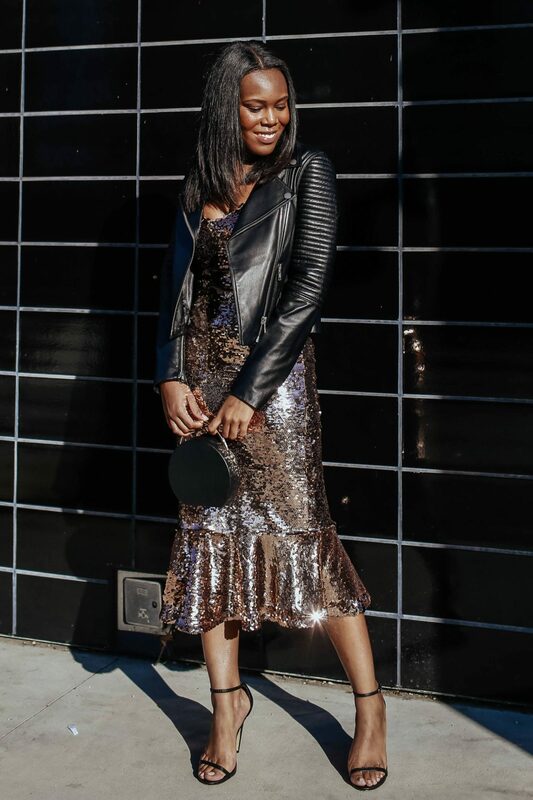 How do you style your sequin dresses casually: Let’ chat! Leave a comment below. P.S. 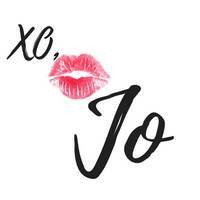 For more style posts, click HERE! SO CUTE! I love dressing up for work every day in december and this was super helpful! Thanks for reading Kait! It’s such a great time to dress up. I love this look! I am very into bold pieces and would wear sparkles all the time if I could haha. Thanks, Ann! It’s always fun to sparkle. I do love a leather jacket over a pretty sparkle dress like this. Adding something like a leather jacket is one of my favorite ways to dress down something that may be otherwise quite dressy. Thanks for stopping by Michelle! It’s definitely one of my favorite ways too!! love the dress + jacket combo! Ok I am living for this gorgeous dress styled with the leather jacket! It’s a perfect mix of glam and edgy! Thank you, Emily! I love styling my looks with a little bit of edge. Thank you, Amanda! I agree they can be overwhelming depending on the styling.